There are a few yards of the white, cotton/silk left—but all in all-- for a pairing up of two odd balls of yarn, it’s a very successful project! The finished length is almost (but not exactly) 36 inches –a very decent length. I am glad I found and finished up this UFO! After that, I finished of the thumb bits on Miss B’s fingerless gloves. I have a pair of those ‘1 size fits all’ stretch gloves –in a soft fuzzy chenille(—$1—reduced from $3 at the end of the season) –I like this style of glove—they are fairly thin—(and fit well under fingerless gloves) come in a range of colors—and they are cheap enough. 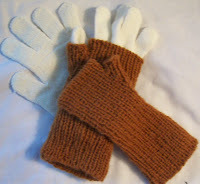 These glove—white chenille-- are extra special (and isn’t that just what a granddaughter needs?) Finding white chenille last year at an end of season sale was a treat. I am still working on the first half of the foot on subway socks—that is, still working on the pattern on the instep side of the socks. But each round brings me closer to plain (and fast!) knitting—and then the toes –when every round is shorter than the previous! I’ve already packed up Knit Kit 1 for my trip—and I am contemplating Knit Kit 2 (another pair of socks? Or a pair of fingerless gloves? 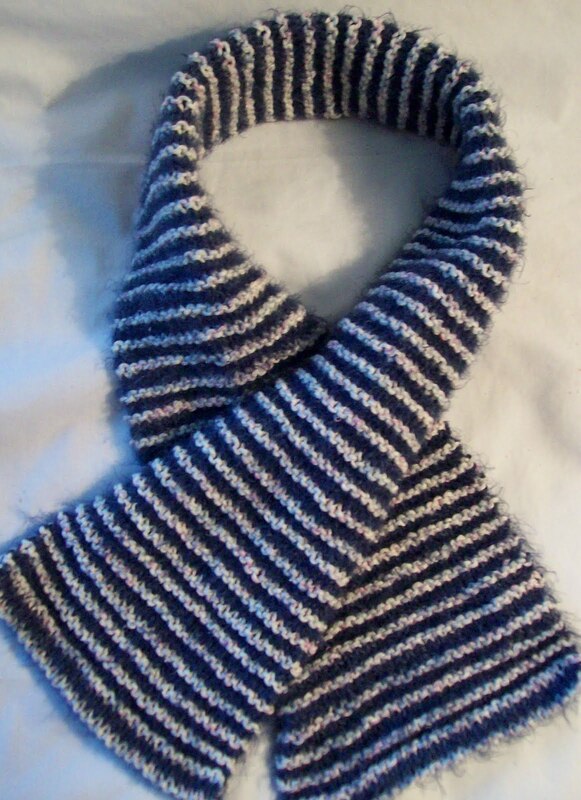 Or the color work tam from Patons blog? Or… What ever I chose, it needs to be small and light! Knit Kit 1 is a new pair of socks—rather simple ones—once I get past the cuff-which is anything but simple! The cuff has a bit of color work—so there are 2 full skeins of Kroy solid (purple) and 2 small balls of Kroy solid (mellow yellow ) and a skein of white—at this point, I think I could get by with a small ball of white.. But... (Who knows, I could be inspired to do something special in the heel flap! The cuffs are also going to require an extra set of needles-- (2 pair of 2 circ’s (4 all together) so I am leaning to bringing more sock yarn.. once the cuff is completed, I’ll have spare needles, and the option of starting a second pair –Black (and white, and stripes? ) and another fancy cuff-- A way simpler one, but not a ribbed, knit in the round cuff. A girl need to have some variety in her socks doesn't she? I am of course, visiting a fiber friendly household—there are needles and stitch books, and resources a plenty! And there are plenty of LYSs too! But—it pays to be prepared! It's computer friendly too--but I suspect, I won't have much time to use one of the 3 household computers --even if I could pry one out of someones hands! I'm glad you finished the scarf, too. It looks great.